You know the idiom, “buy low and sell high.” While correct in principle, it’s not actionable if you don’t know how to define the terms “low” and “high.” Here’s what you need to know. You can’t just tell a new investor to buy low and sell high. Yet if I search listings of cars for sale, I can find the same 2014 Toyota Highlander selling for about $33,000. If I sell my used Highlander to a dealer for a trade-in on a new car, they’re going to be buying it at a WHOLESALE value — in this case around $24,000. Wholesale is what a retailer pays in order to then sell it for a higher price to an end user. When I sell to the person who needs the car, they’re going to be buying it at RETAIL value — in this case $33,000. Retail is the price paid by an end user. I can take my Highlander to any dealership and get that $24,000 wholesale price. But when I sell for the $33,000 retail price, I have to wait for the right buyer who wants the color and options my vehicle has. If you ever watch those house-flipping shows on HGTV, you’ll inevitably hear of a listing that just came on the market where the owner needs to sell as quickly as possible for personal reasons. Real estate investors want to buy at wholesale prices so there’s more profit potential when they go to sell. They can buy at wholesale prices because they have the cash to quickly close the transaction. A house might be sold for a $200,000 WHOLESALE price to the first investor who shows up with cash. If the real estate agent’s network is large enough they can likely have it sold within hours. In contrast, selling that same house to the right buyer for a $270,000 RETAIL price might take a few weeks or months. If I buy a domain name for a $450 WHOLESALE price on NameJet or GoDaddy Auctions, I may later sell it for a $4,000 RETAIL price to a person who needs it for their business. Wholesale is the price that one or many investors may quickly pay for the asset, if given the opportunity. Multiple car dealers, multiple home investors, multiple domain name investors…they’ll all pay around the same wholesale value. Retail is the price that the person who needs the product will pay for their personal or business use. You’ll have to wait longer to find the right buyer who will pay that retail price. Buying a domain name at its true wholesale value should always be low-risk to an investor, because they should be able to liquidate the asset on a marketplace or to another investor at any time for within 10 to 20%. If they can’t, they likely didn’t buy at its true wholesale value or they don’t have access to a large enough network. If you’re not sure how to determine wholesale and retail pricing or you don’t have a large enough network to verify wholesale prices, DNAcademy is where you want to start. Thanks for watching. See you on the inside! Very well explained. Great to see you back in action, Michael! Thanks, Todd. 🙂 It’s good to be back creating new tutorials and content for the community. great examples. now i get it! Awesome! Great to hear, Aparna. Thanks for watching. Network not large enough. Good point! I think we all face the “network not large enough” issue to some degree, which is why marketplaces like NameJet, GoDaddy Auctions and Sedo can come in handy. In the course, I share when to use each type of marketplace in our proprietary 6×6 Sales Matrix. Thanks for watching and taking a moment to post a comment! All good points. Good lesson. Always enjoy your comments. Good article, but the follow up question and explanation are much more interesting. How do you explain the large difference between wholesale and retail in domain investing to a domain (portfolio) seller? In the car example the difference is 37,5% in the domain example the difference is 788.9%! The less transparent and inefficient the industry, the larger the differential between wholesale and retail. For example, before the commercial internet you wouldn’t know much about the price of a bottle of wine at your local liquor store. You’d have to drive between your liquor store and the supermarket, hope they both have the same wine, varietal and year, and then compare the prices. The work involved in doing so was high, so less people did it. As such, the difference between wholesale (the price the stores paid) and retail (the price they sold it for) was higher. As apps came along that allowed you to scan a UPC code or label and find the price at many stores, the industry became more transparent and efficient and the price differential between wholesale and retail was lowered. Cars followed suit after (or maybe before) products like wine. But the car industry is still opaque in couple of regards: used vehicle pricing (since wholesale is not as well defined as for new cars) and manufacturer rebates to dealers on new cars. The domain name industry is even more opaque and inefficient, mainly due to each domain name being unique. There is only one X.com, whereas there are many limited edition whatever cars. This is one of the main reasons that investing in domain names can be so lucrative, and why do many new investors are entering the industry every year. It’s an answer but I don’t believe it is the full answer. Domain investing is a very speculative business and the sales rates for passively managed portfolio’s are low (0-2%). So the ROI(in the example $3550) on the single sale must make up for the lack of ROI of dozens to hundreds of other domains the seller holds. So when buying at retail price you are paying for the speculation of the domain seller. You can even go a step further and conclude the buying low and selling high often does not give a very lucrative ROI. If we continue with the example and assume a sales rate of 1 %. The seller has bought 99 other domains at $450. Then it’s total investment is $45000 with a yearly ROI of $4000(8,88%) namely one sale per year . Add the registration costs to the equation and the time spend in buying the domains and answering inquires the real ROI goes down and perhaps is even negative. 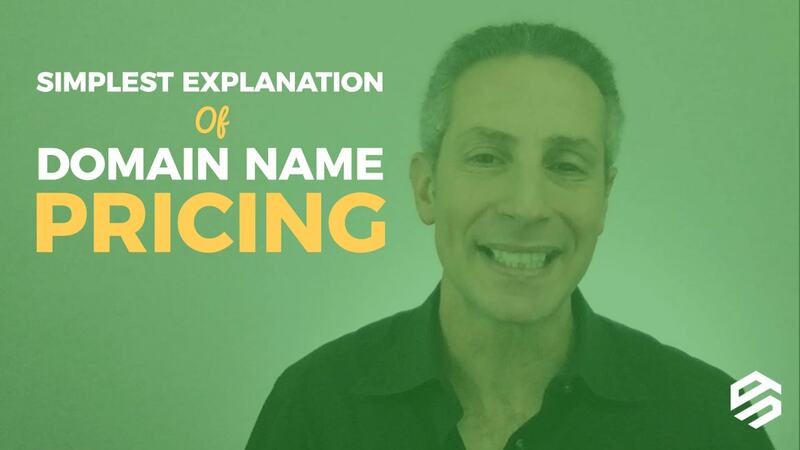 I see a lot of domain flippers than domain investors in this industry.Pricing of domain name is really key…you must have an eye and purpose of the domain name and the price range it falls, etc to be able to price at a retail price.